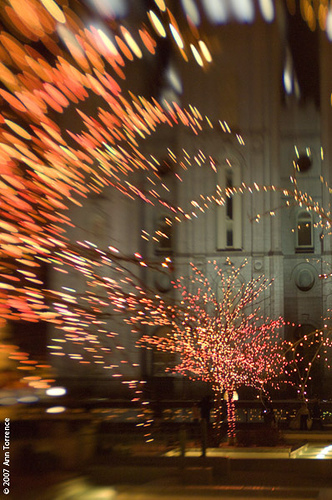 I, for one, am hoping for some wet weather for the December Photowalk because of the reflections of the lights in the wet concrete at Temple Square. The Highway 89 project has given me ample opportunity to work out a wet/cold weather practice for myself and my gear. I spread out a trash compactor bag on the seat where my camera bag rides. If you read nothing else, skip to the end to find out why. It could save you a from an optical disaster. Otherwise, venture forth. Your mom was right: wear a hat. Preferably one that blocks wind. Even better if the brim flips out of the way so you can keep it on AND see through the viewfinder. A hat and the warmest, driest shoe/sock combination in your possession delivers you 90% of the way to comfortable in any weather. As for in between, I use the tried-and-true three layer method: inner wicking layer to keep dry*, thick middle layer to keep warm, outer layer to block wind and wet. No cotton, no denim, lots of fleece. It ain’t a fashion show out there. Gloves: Some people like the photographer’s gloves, I wear some fingerless combo glove mittens I picked up at a truck stop in Wyoming. The price was right–I guess truckers don’t spend disposable income like some photographers. At -25°F in Yellowstone I used inner glove liners under a waterproof glove topped by some mittens, stripping down the outer two layers as needed. At -25°F your exhaled breathe freezes into sparkling crystals. Tequila acquires an unctuous thickness. The vapor in Old Faithful’s plume froths up into a voluminous cloud. I digress. Chemical hand/foot warmers. These work, but you need to give them ample time to get the chemistry going, especially in closed boots. They need some exposure to oxygen to get cooking, and then they keep going for hours. * A dear elderly lady once told me “horses sweat, men perspire and ladies effervesce.” I haven’t seen any anti-effervescence underwear on the market yet. No doubt it would be a rose-colored set of silk thermals. The DIY camera cover: in between shots, I cover the camera with a plastic dish cover from the grocery store. I bought a new package this week for $1.99. The ones I like best are made of colored plastic that can be doubled over as a flash gel, but the new ones have flowers on them. Yes it looks goofy. No it’s not perfect. $1.99 justifies a multitude of sins. Make sure they don’t blow away. I use a microfiber cloth, which I want to keep clean, on the lens itself. If it’s really wet, I pack along a bandanna or golf towel to wipe off mist and droplets from the exterior of the body and lens. Most new cameras are well-sealed, but dry is the best insurance. It’s equally important to keep the inside of the camera bag as dry as possible, so be sure to wipe down everything as you put it away. If it’s blowing up a storm and I still have reason to be out, I will either use the all-weather cover on my camera pack, or put the entire pack in another trash compactor bag, wrapping the mouth of the bag into the carrying handle of the pack. The golf umbrella comes along if I have a helper. Mostly it’s for the helper’s comfort. In cold weather, batteries tire quickly. I keep fresh batteries in a warm pocket. Sometimes a seemingly empty battery revives after warming up again, so I put those in a different pocket as I change them out. Plastic and metal get more brittle in cold weather. Fingers don’t work so nimbly. The combination can be costly. Don’t force anything. Cable releases are especially fragile characters in cold weather. After a cold shoot, it is so tempting to jump in the car and get the heater running. Stop! Remember that big plastic bag? First, your camera pack goes in the trash compactor bag. You know how the car windows or your glasses fog up, not while the car is cold, but while it is heating up? The same thing can happen to your optics, even if the weather is seemingly dry out. Those many-element lenses can get condensation on their interior faces, where only an authorized and highly-paid technician can clean. Even worse, a really bad case of condensation might fry the camera’s electronics. Hopefully, your gear is pretty dry in its camera bag (having used the bandanna, golf towel or whatever you brought). Wipe down the exterior of the bag. Then seal the camera bag (but not the wiping rag) in the garbage bag. Ignominious, but necessary. The idea is to have any condensation form on the outside of the garbage bag, rather than my optics. I’d put the whole package in the trunk, if I had a trunk, but somewhere away from the blowing car heater. The goal is to slowly re-equilibrate the temperature of your gear with the ambient conditions where you store your camera. Once the camera is up to room temperature, you can take it out of the plastic bag. I try to remember to put my CF cards in my pocket beforehand, so I can leave the bag sealed up until morning. I like the trash compactor bags because they are incredibly sturdy, inexpensive, and reusable. They are tough enough so that the buckles and do-hickeys on the camera bag won’t rip a hole in the plastic. I’ve found many uses for the humble trash compactor bag in outdoor adventuring, none so important as a moisture barrier at the end of a cold weather photography session. Thanks for the great tips. These are great reminders and a the timing is perfect. Thanks again! The moisture barrier suggestions are one of the best tips ever! Thanks Ann.